Let's Make Your Lacrosse Game Better TODAY! 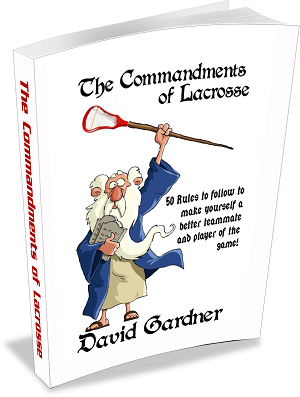 With the Commandments of Lacrosse You Will Learn 50 Ways To Become A Better Player and Teammate Of The Game Of Lacrosse! Includes Instant Access to the Digital Version as well as bonus drills! Grab ONE copy of the PHYSICAL Book Today and I'll hook you up with a DIGITAL copy as well! We have Bulk Order Options to help achieve our mission of one book for every player! But, if you just want one for yourself, then go ahead and just click the buy now button above! Product Fulfillment: You will receive instant access to the digital copy of the book once your payment is processed/registration completed. You will receive a confirmation email with in 24 hours verifying your shipping address and then your physical book copy order will be processed, printed and shipped within 2-5 days and should arrive within 7-10 days. Thrive Cart/Paypal is the processor of this payment and who your receipt comes from. Terms of Service: You are ordering a physical copy of a book published by Dave Gardner. Your order may reflect processing your credit card or bank statement with a charge by Thrive Cart/Paypal or David Gardner.